Sarah is hunting for a diamond, and the last thing she needs is the infuriating Hart distracting her. But he’s looking for the jewel, too! They may be rivals, but the sparks between them are uncontrollable. And soon Sarah finds herself longing for another treasure—becoming Hart’s countess! Sarah Forrester is the daughter of an American diplomat, who is currently on assignment in England. When Sarah intercepts a letter intended for her father which indicates that her deceased brother was a traitor, not the hero they believed him to be, she decides to comply with the would-be-blackmailer’s terms. The unknown correspondent requires that he receive a missing diamond in exchange for his silence. The path to the diamond is somewhat of a scavenger hunt, as the clues to its whereabouts are painted on links of a bracelet belonging to Lady Everill, who constantly wears the bracelet, never letting it out of her sight. The blackmailer is not the only one who wants the diamond. The Regent himself is eager to have it, and has enlisted his friend, the Earl of Hartwick (“Hart”) to retrieve it. Hart and Sarah are acquainted, as their best friends are married to each other. They have a bit of a snarky relationship, though they actually enjoy the sniping with each other. As they each set off on their quest, they keep running into each other. It’s soon obvious to both of them that the meetings aren’t coincidental, and they both want the diamond. At first they have no reason to trust each other, and are very cagey about their motivations, but when they reach an impasse because they each have one key, they devise a contest where the one who solves the final puzzle will win the diamond. Hart is a charming, handsome, somewhat arrogant rake. who regularly sleeps with other men’s wives. I have to admit that this really bothered me, as it said to me that he didn’t respect marriage and had no qualms about cuckolding his peers. We later learn that this is not a lifestyle that he just fell into, but rather one that he made a conscious decision to adopt. Beneath his outward carefree appearance, he hides a lifetime of hurt, confusion, and a sense of abandonment. While I could never fully justify the choices he made, I at least came to understand his motivations and reasons. Sarah is fearless and determined. I admire her resolve to protect her parents from any further grief over her brother’s actions. Though some of her own deeds weren’t the wisest, and certainly were dangerous, her heart was in the right place, and I liked her very much. I loved her honesty and her ability to stand up to Hart, and to give as good as she got. When Sarah and Hart take a break from their hunt long enough to indulge in a kiss, they discover a sizzling connection that takes them both by surprise. When temptation becomes too great to endure, they agree to give in to passion, with no expectations and their eyes wide open. Hart has no intention of every marrying, and Sarah will be returning to America when her father’s diplomatic assignment is complete. Even if they wanted a future together, it’s not possible. Before long, I found myself totally engrossed in AN UNEXPECTED COUNTESS. The sheer fun and outrageousness of some of the scenes and dialogue had me smiling, and hoping that this seemingly unlikely couple could find a way to be together. Hart won me over as he discovered that he did have a heart and was capable of love and of changing. Author Laurie Benson also tossed in a couple of interesting plot twists, and penned an intelligent resolution that left me very satisfied with the outcome. AN UNEXPECTED COUNTESS is well written, passionate, complex, and a very enjoyable read. 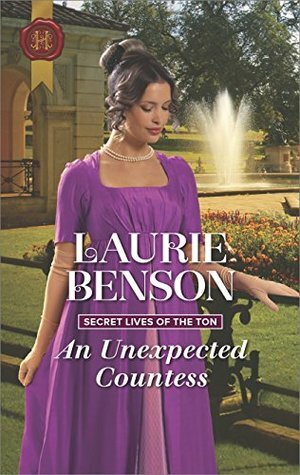 Author Laurie Benson will send a signed copy of AN UNEXPECTED COUNTESS to one person (United States only, please) who leaves a comment below. Winner picked on May 28. Good Luck! This does sound like an hysterically funny read! I love it when dialog and scene get me laughing! Thanks for the interesting and intriguing review. I haven’t read this author and I’m always on the look-out for talent. I haven’t had the opportunity to read Laurie Benson’s stories even though I’ve heard of her…I adore cover illustrations with white font…wouldn’t mind meeting her while browsing antique shops then going to a coffee house and sit, drink and listen! This sounds like one I’d like to read. Thanks for the chance. I have yet to read this author, and would love to win the book. Thanks.